Integrate using the Web Connector. Step by Step instructions. An administrator account with Buddy Punch. The QuickBooks main administrator account. (A different user with admin rights will not work and may cause unexpected behavior). The first Edit area in the settings will allow you set a starting point for importing time. If you are switching from a different solution you can use this date as a start point of when you want time to be available. Buddy Punch will only sync time logged on and after this date. QuickBooks Desktop communicates with Buddy Punch using a Web Connector. Install the connector, then download the connector file. When you open the connector file QuickBooks Desktop will prompt you for a password. The password is auto-generated for you in Buddy Punch. If you have never used a connector before a screen shot is below. 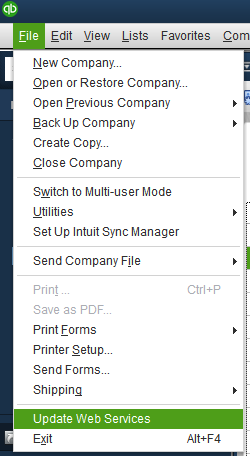 The "sync" between Buddy Punch and QuickBooks Desktop is initiated from QuickBooks. 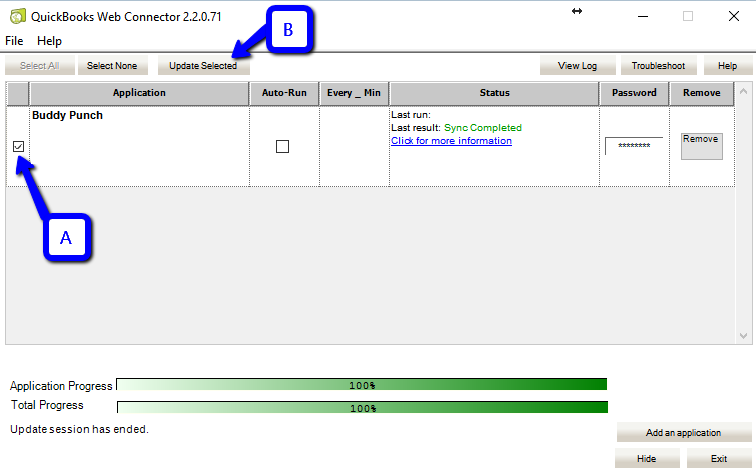 After you install the connector to open it go to File --> Update Web Services. Then you'll get a pop-up box to edit and run the connector. The connector will then run, wait for the total progress to reach 100%. You'll use this process later to transfer time, but more setup is required for it to work. See below to continue setup. Setup is complete! 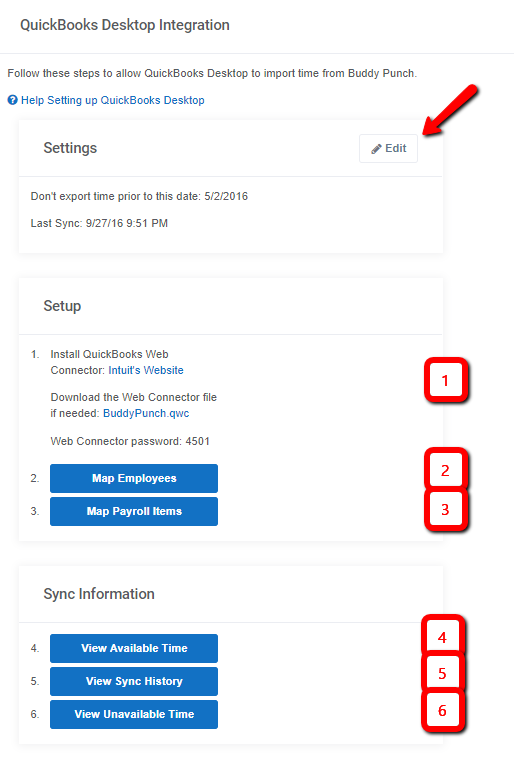 You can now start to Sync time (remember you'll be using the web connection from Step 1 - each transfer will require you to run the Web Connector. Time is not transferred automatically). The next 3 options will help you while syncing time. These areas do not require setup but will help you identify what you're syncing, what is available, and help you troubleshoot if some time is not syncing. This option will show you what time is available to sync. This is good to use to verify what you'll be syncing when you use the web connector. 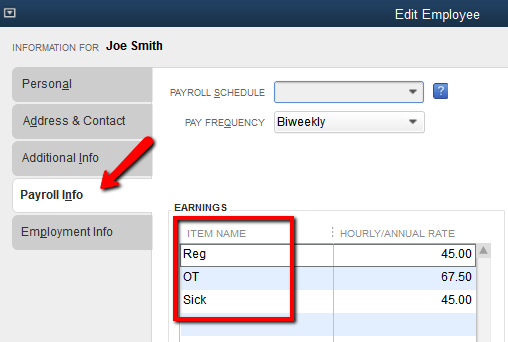 The Sync History will show you what was transferred over to QuickBooks. You can see each Sync and their details. This will show you why time isn't showing up as available. QuickBooks has rules on what it will allow you to transfer over. If you hit any of these rules this will show you what those are and what you need to do to correct them. Here are some examples. You can't transfer time over from an open pay period, you can't transfer over a punch in and out with zero time, and one employee hasn't been mapped yet. Once these change they will show up in the "Available Time." Please Note: Buddy Punch does transfer PTO, however, we do not update any PTO accrual balances in QuickBooks Desktop.